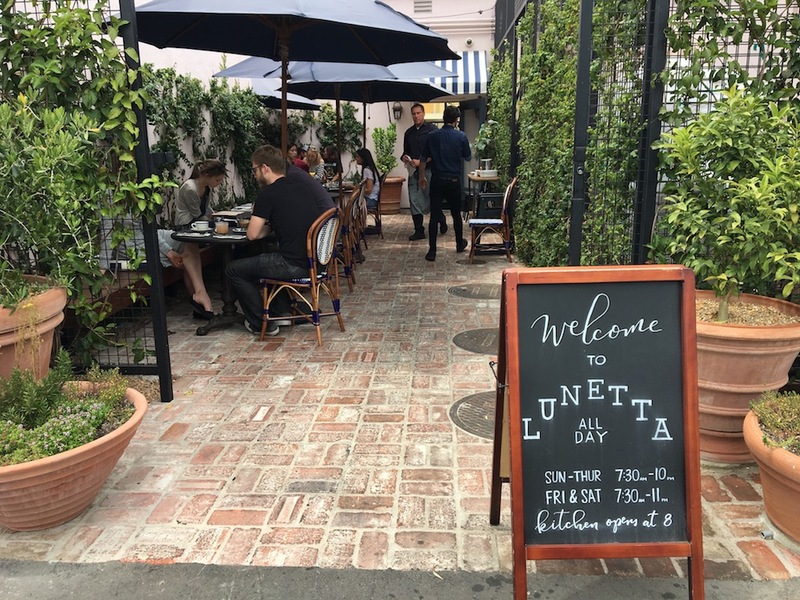 My first experience with the Lunetta restaurants was when I had lunch at the bar of Lunetta All Day. It's a cheery spot with a pretty outdoor patio and a handful of indoor tables in a high ceiling room. 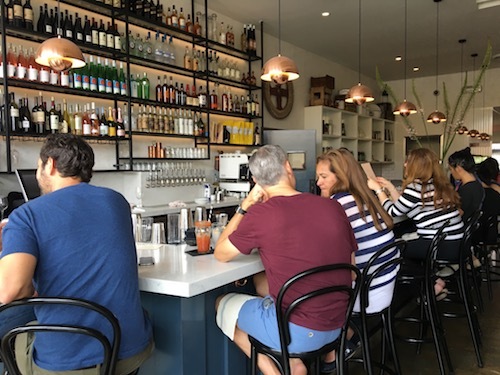 Lunetta All Day bills itself as a neighborhood diner. I'd say think bistro more than greasy spoon. Breakfast has egg sandwiches, grain based bowls, lemon ricotta pancakes and avocado toast. For lunch, there's a collection of salads ranging from a classic Nicoise to a shaved vegetable salad with fennel, papaya, cucumber, carrots and roasted cashews. There are also burgers, chicken sandwiches and a special grilled fish entree each day. Greasy spoon it is not, but it does offer modern adaptations on ingredient driven, staple dishes. Directly next door is Lunetta. This is the more formal dining room in the former Josie space on the corner of 24th and Pico. There's a cocktail bar on one end serving drinks for waiting diners, and on the other end, there's a bar for dining that overlooks the kitchen, similar to Lunetta All Day. It was hopping on a recent Saturday night when I visited. That meant that there was an exciting buzz in the restaurant, but that it was also really loud. You've been warned. 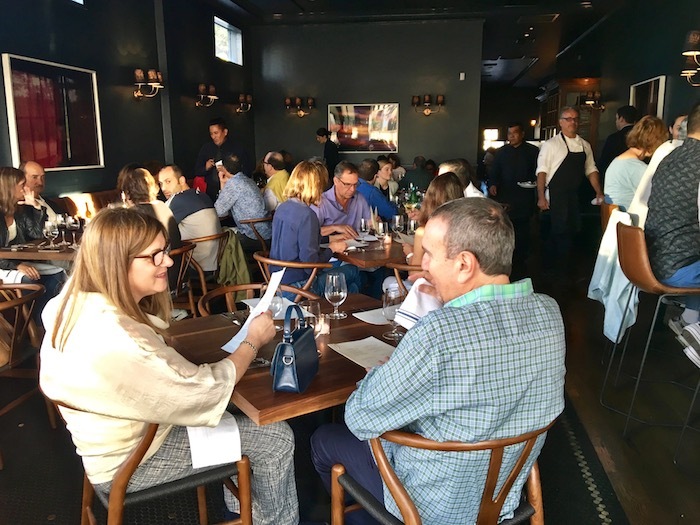 The dinner menu at Lunetta is a concise one sheet or familiar dishes, slightly elevated. Baja kampachi was punctuated with a citrus-soy gremolata, Sungold tomatoes, and lime avocado. 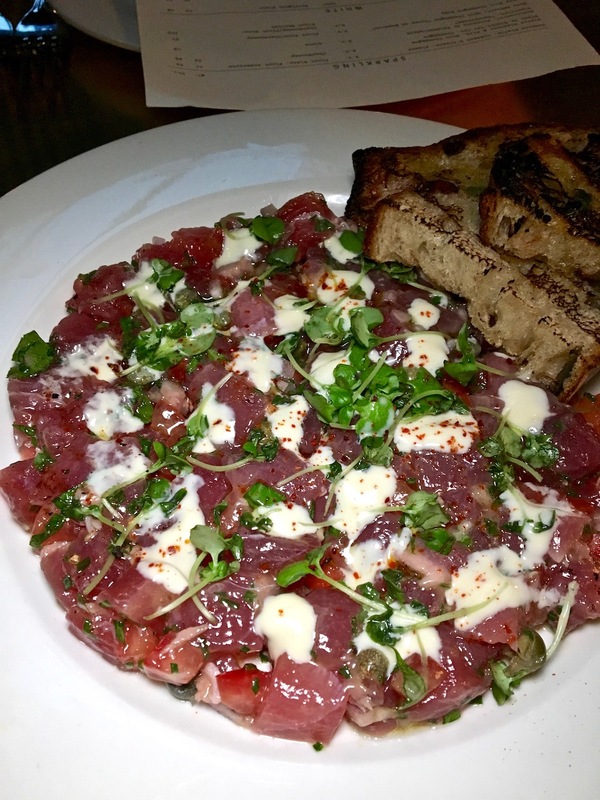 The ahi tuna tartare was a generous portion of fresh tuna mixed with accents of parsley, shallots, capers, and a creamy anchovy dijon. There was also a caesar, tomato salad and seasonal grilled stone fruit salad. Our waitress highly recommended the loup de mer. It's cooked on a wood grilled oven so it has a crispy exterior and is peppered with Bali spice, giving it a nice kick that's offset by a side of Thai noodles. Vermicelli glass noodles get a nice citrus kick from lime and a touch of cilantro with shrimp. Overall a nice combo of heat and sweet. You can also find your usual salmon, jidori chicken, skirt steak or you can go in with someone on the 22 ounce Aspen Prime or New Zealand rack. Most entrees hover just over the $30 and the meats for two are $68 and $72, respectively. 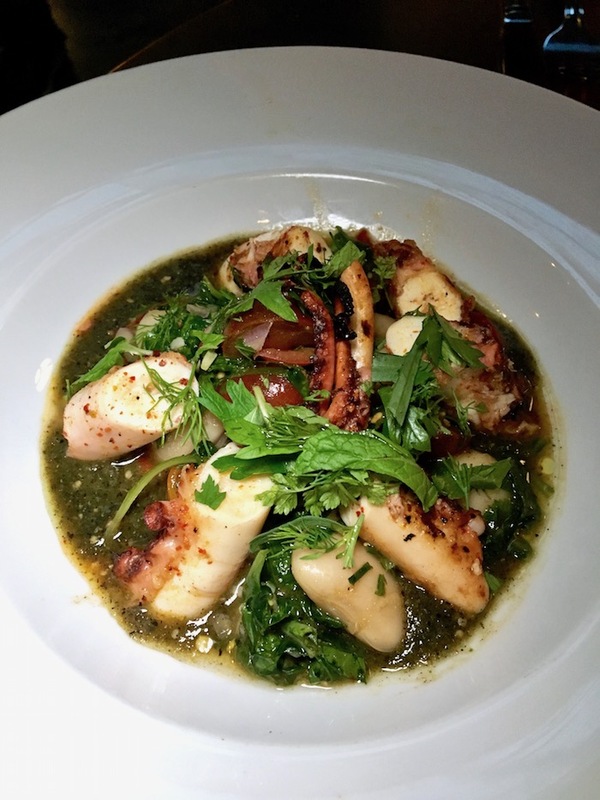 We also lucked into a spicy special of grilled octopus with white beans in a zesty green sauce. It was hearty and delicious. The proteins do well cooked on the wood fired grill, as does the seasonal side vegetable dish. While we were there, we had asparagus, zucchini, and corn - all made even more savory by the smokey notes of the grill. Sadly, we were too full to indulge in some of the beautiful looking desserts like sticky toffee pudding and butterscotch pot du creme. Both Lunettas offer a nice dining experience, depending on your mood and your wallet. 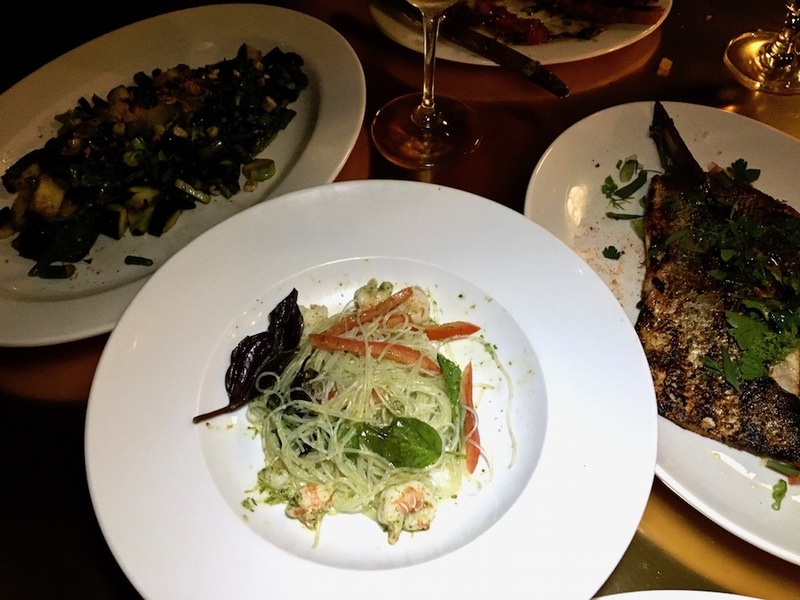 You'll want to reserve at Lunetta, but you can just stroll into Lunetta All Day for a more casual meal.